Australian records were broken over the weekend in the Iconic Gosford Classic Car Museum Auction including $1.55 million for an Aston Martin DB5. Approximately 10 records for Australian cars alone were broken for Holden models. Australian market cars weren’t the only ones to break records with both American and more particularly European Luxury indicating that markets are extremely strong here also. “It’s incredible the amount of people that showed up to the auction, as well as their dedication to watching the spectacular 9-hour live event,” said Jeff Thomson, former Australian Cricketer and world’s fastest bowler. “The strong amount of bidding and prices achieved for Australian Muscle cars in particular was of great interest to me. I think it is fantastic that the majority of bidders were Australian, meaning the cars stay here,” he continued. “Proof that the Australian market is really strong came with only 2 international bidders successfully winning cars. It proves that Aussie car collectors value their classic cars and heritage,” said Mr. Alan Jones, Formula 1 World Champion. “I am not surprised at the prices achieved in this World-class auction over the weekend attracting international attention. The cars got what they deserve, in a fantastic event which served as a true send-off in what was an emotional day of mixed feelings for both Lloyds Auctions and the Gosford Museum,” Alan continued. “It was a huge success pulled off by a great team including the staff at the Gosford Museum. I can confirm the owner of the collection is extremely happy with the result,” Lee continued. Some of the record-breaking highlights include 1964 Aston Martin DB5 selling for $1.55 million, the Aussie 1997 Aussie Invader III LSR JET selling for $455,000, the and the 1930 Packard 740 which sold for $225,000. With the majority of bidders being Australian it is safe to say that enthusiasts nationwide are extremely proud and passionate people fighting to keep their beloved cars in their country where they can enjoy them. 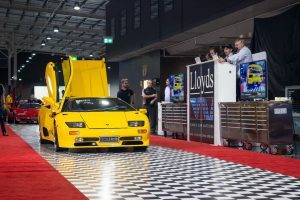 The world-class event described by many enthusiasts that attended the auction, solidifies Lloyds as a World leader in the European and Prestige car market and proves that Australian car fanatics are as passionate as any. Lloyds also had a surprise in-store revealing a special upcoming auction during the online live stream where Alan Jones stated that another Walkinshaw Andretti United Supercar, James Courtney’s chassis of #23 is to be auctioned at the end of this month. Head to the www.lloydsauctions.com.au for further details.